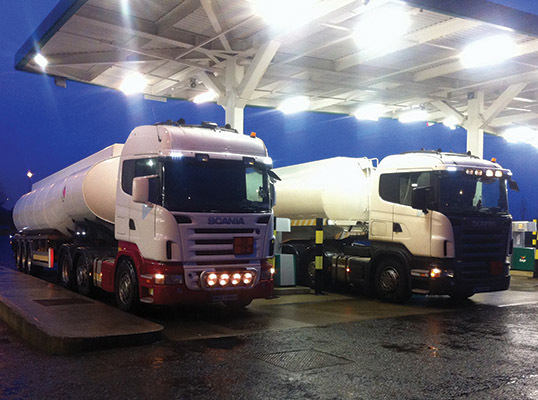 Galway-based Petrohaul Ltd. is one of Ireland’s premier transporters of fuel and hazardous goods. We caught up with transport manager Niall O’Grady, who doubles up as in-house Dangerous Goods Safety Officer, to discuss the expanding family business’ excellent safety record and current well-being. Petrohaul Ltd is an outstanding family- run business, which was established in 2008 by Peter O’Grady and his wife Norrie alongside their son Niall. Based in Belclare, outside Tuam in County Galway, the company specialises in the transportation of flammable liquids and hazardous goods from Galway, Dublin and Foynes Ports and also carries out general haulage using flat trailers. The fleet comprises tractor units, fuel tankers and flat trailers and Petrohaul are fully certified to carry all Hazardous Goods with all units tested and approved to carry out operations from the major Irish fuel terminals. All vehicles are subject to a strict maintenance plan and are fully compliant with relevant industry regulations in regard to the upkeep of the fleet. The owners follow all prevailing guidelines and regulations to ensure that standards not only meet but exceed all safety and operating guidelines. The fleet is fully tested and compliant, with all current ADR and safe loading pass certificates in place. Reflecting on the genesis of the family business, Niall O’Grady notes: “We’ve been involved in haulage for three generations. My grandfather had tipper trucks and sand pits through the years and then in 1986 my father set up O’Grady Oil Ltd., which was a home heating company. After a few very successful years my parents sold that business and in 2008 set up Petrohaul as a fuel transport business. As well as being a director, Niall, who is supported by his wife Emma in his day-to-day activities, serves as transport manager and DGSA. "Emma is a great help by keeping on top of some of the paper work and is a great help by updating the maintenance reports and keeping an eye on new regulations introduced into the industry. Family support is very important as the days can be long so with Emma helping out it makes some of the work easier." Since its inception seven years ago, the business has maintained an exceptional track record: “We are constantly monitoring the fleet to make sure that everything is up to scratch. We stay up to date with all RSA regulations, which can change quite often.“I have a very strict drivers manual in place, insisting on daily checks, ten-minute walk-arounds and all faults noted and reported. Also, when loading in the fuel terminals and delivering to depots and stations we are trained fully and aware of all surroundings, risks and hazards. We have all the necessary safety equipment in place and comply with top standards for the loading and offloading of fuel to ensure that there are zero accidents. Safety is a key aspect of the day to day running of the business. Safety statements, risk assessments and procedures are updated every few months. “We have a very good relationship with the RSA and we welcome regulations introduced because it is uniform across the industry and all hauliers have to comply – you can’t get fairer than that. At the end of the day, the primary goal by the RSA is to reduce road fatalities and accidents so by complying with them we at Petrohaul feel we are playing our part along with the RSA." Transporting Class 3 flammable liquid throughout Connacht, Munster and parts of Leinster on behalf of Corrib Oil and Sweeney Oil is the mainstay of the business, however they also transport bitumen for Cold Chon and RMS during the summer which falls under ADR regulations and during the spring months they transport fertiliser for Goulding Chemicals Ltd. from Askeaton, Limerick and Oranmore, Galway. In the last few months with the upturn in the construction sector they have started to carry out work for Murry Timber Group and McTigue Quarries. Petrohaul boasts vast experience in carrying fuel and all manner of hazardous goods and is certified to transport all classes of dangerous goods. “We had a very busy winter as there was stronger demand for fuel due to dropping oil prices which was a great help as it also greatly reduced our fuel bill” Niall adds. At the heart of the operation is an immaculate fleet, kept in superb condition at all times. While some basic maintenance and servicing needs are met in-house, Michael O’Connor of O'Conchubhair Commercials and Stephen Rice Commercials are called upon to handle the bigger jobs. Michael O'Connor is looking after our fleet for the last number of years and Stephen Rice has the best of technology to keep our trailers in the best condition. It us important to have good strong contacts locally to call on when repair work has to be carried out and all our parts are sourced locally from John Mannion Truck & Trailer and Mannion Motor Parts. Meanwhile, the latest addition to the fleet – the 141-reg Mercedes – was bought from Kinahan Commercials in Moate, Co. Westmeath with a little help from AIB Tuam. All in all, business has been extremely brisk of late and further expansion is on the cards. “We have three drivers at the moment – myself, my dad and John Lardner – and we’re all busy,” Niall confirms. “You would always be hoping to expand in the future and move with the times. Since the purchase of the Mercedes some costs have fallen such as repairs and the fuel bill so we will consider adding another new truck inside the next 18 months. It will be straight back to Ian Folan in Kinahans for more tough negotiations. Petrohaul have come a long way during challenging times for the sector as a whole. “The year we set up, ’08, was the start of the crash and we had a few tough years in the beginning,” Niall concludes. “However, there has been an increase in work over the last three years and a lot of that comes down to the having a good fleet, loyal customers and plenty of hard work"